For those of you who live in the warmer climates with nice solid roads year-round, you can skip this post…or read-on if you’re interested in a virtual glimpse of dog walking in the snow. WARNING…It isn’t as fun as what you see on Christmas cards or in romantic comedy movies! Does Your Neck of the World have Slippery Roads in Winter? If you’re a pet sitter who lives in a snowy climate part of the year…this is for you. I’m guessing you’ve most likely had a few heart-twisting moments when your feet slipped out from under you. Yes? (Did you notice the dog at the other end of your leash didn’t slow down at all? They also think it’s a great game if you land on your rump beside them!) Besides feeling ridiculous at falling, you could really hurt yourself…break a vertebra, your tailbone, a limb, or bang your head. So…how do we prevent a fall? For newcomers to pet sitting, please go out and buy rubber boots as a starting point for safety. Get ones with the best treads you can find, nice thick padding for warmth, and a good insole since you’ll be spending lots of time in them. (Most likely you’ll be buying a size larger than usual.) They’ll cost the same as other winter boots, look a lot less fashionable, but will allow you to walk through anything from puddles, to slush, to snow or even dry roads on cold days – year-round actually. 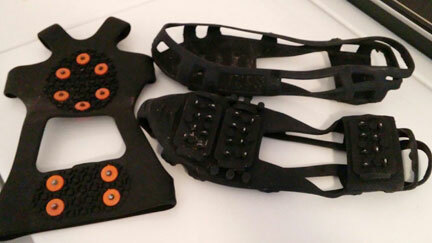 The better treads will help you keep your traction in the snow as well. But…boots can only do so much. After a snow plow has pounded down the snow it’s left behind or cars have made strips of ice from their tires on the snow, or there’s just a general build-up of ice beneath the loose snow, you’ll be beat unless you have metal cleats on your boots. For some reason, I resisted the cleats the first year out. I figured I could handle the snow. Then we wised-up and we instantly felt safer. Walking in them on snowy, icy roads is a breeze. On dry roads they feel less comfortable but are still safe…but on cement or tile, they’re incredibly dangerous to walk on. They’ll skid out from under you faster than rubber on ice. So take extreme care when entering garages and remember to remove them when heading into a store. Winter conditions can last a lot longer than the three actual months of winter, so this year…and going forward…put your snow safety to the top of the list with great foot ware. Until next time…stay safe out there!